Your quest is to run far and gather as much treasure as you can for a high score. Tap to jump and collect treasure! Tap twice to double jump! Jump on Monsters to kill them! Jump to avoid flaming arrows! 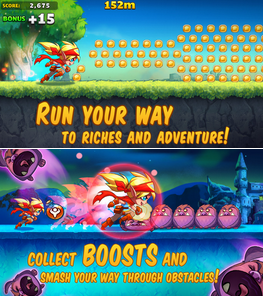 Keep running and collecting treasure to achieve new high scores. you can and collect as much Treasure as possible! You will be awarded Gold after each time you run. far you run and how much Treasure you collect. game to give you potent but temporary abilities. A Runner is the character you use when playing. How do I upgrade Runners? more. Check them out in the Shop! regardless of which Runner is equipped. You can reset your daily mission or receive daily rewards without waiting for Treasure Run!. You can get this cheat by changing your phone's time setting. Close your Treasure Run app by either restarting your phone or by killing it on your task manager. Open Treasure Run app and you will get instant daily reward or reset your daily mission. Open Treasure Run app but do not play a single game. Open Treasure Run app just to make sure that there is no problem.